BBC Music Magazine: outstanding; Music Web International: outstanding. 'Consistently outstanding performances, musical beyond belief, and worthy of any collection' (MusicWeb International); 'Yet again a fine achievement, striking the right balance between deep contemplation and freshness of approach.' (International Record Review); 'The same thrillingly high standard as the whole series.' (Pizzicato); 'Suzuki and his Bach Collegium Japan continue to overwhelm us.' (Classica-Répertoire) – the list could go on and on! These quotes from all over the world apply to Volume 28 of Bach Collegium Japan's Cantata cycle, but the reception has repeated itself throughout this series. 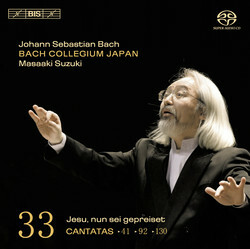 On the present, 33rd instalment Masaaki Suzuki has chosen to open with a jubilant New Year cantata, Jesu, nun sei gepreiset, first performed on 1 January 1725. Only a few weeks later BWV 92 was performed, exhorting the congregation of Bach's Thomaskirche in Leipzig to surrender to God’s will and God’s hand. In this unusually long cantata Bach pays special attention to creating variety, and illustrates the text with powerful musical images. The closing cantata is BWV130, composed for Michaelmas - a feast day in celebration of the Archangel Michael and all the angels. Again a festive work, in which trumpets and timpani play an important part, notably in the bass aria ‘Der alte Drache brennt’, a display piece in which the trumpets play as if in combat with the ‘old dragon’. Here we also hear German bass singer Dominik Wörner, who with this disc makes a fortuitous début with the Bach Collegium Japan. He is joined by Jan Kobow, tenor, who has appeared before in the cycle, and regular soloists Yukari Nonoshita, soprano and Robin Blaze, counter-tenor.